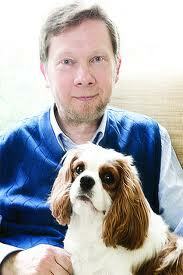 A number of years ago I learned about Eckhart Tolle and began following his writings. The first book I read was “The Power of Now”. This book changed the way I see myself and the world. I have since read numerous books by Tolle and am amazed by his insight. So, I was thrilled when my dogs, with the help of my lovely wife, gave me “Guardians of Being” for my recent birthday. 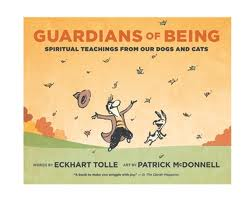 The full name of the book is “Guardians of Being, Spiritual Teachings from Our Dogs and Cats” The words are by Eckhart Tolle, spiritual teacher, and the art is by Patrick McDonnell, creator of the comic strip MUTTS. These two are truly inspired and work wonderfully together. In Tolle’s writings he often speaks about dogs and how they can teach us to be in the Now, so I was excited to read this book. I have already read it 3 times. It will definitely be one of those books I keep close and re-visit. 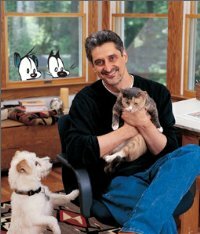 Anyone who has ever loved a dog or a cat will love this book and as you read you will find yourself saying YES! I know that! I knew that! I feel that! Tolle teaches that all animals - dogs and cats specifically - as we live and love so closely with them, are in the original state of consciousness and are not encumbered by the human mind and ego which keeps us locked in the past or present and not in the now, where dogs and cats reside. So by observing our animals and being in the here and now with them we can learn to better experience the joy of life. The quotations above are just a sample of the great wisdom in this book and the great wisdom of our pets. The art by McDonnell which accompany Tolle's words, go along with these teachings to highlight the words and the wisdom. I would encourage all pet owners to read this book to remind you of the spiritual wisdom they possess and to assist them in doing their job of being Guardians of Being. I have this book too- love it!